Google wants virtual reality to be everyone’s reality. On June 27, Google announced an expansion of its Expeditions program, through which teachers armed with tablets, phones, and a Google Cardboard viewer can take students on virtual tours of places ranging from Antarctica to the International Space Station. According to TechCrunch, as of June 27 Google is making Expeditions available to anyone with an Android device, inside and outside the classroom. Google also intends to make Expeditions available for iOS devices. On June 28, Google shared an online demo showing how creatives, using Google’s forthcoming Daydream VR platform, can create animation in VR without possessing any specialty skills. Daydream, announced at Google’s I/O event in May, will encompass VR-enabled smartphones, a new VR viewer and controller (making Cardboard unnecessary if you can afford the viewer, whose price is unknown), and apps that will unlock VR content ranging from news to games. Daydream will be available on the Android operating system. In addition, on July 29, roadtovr.com reported that Google is developing a feature for its Chrome browser that will allow you to browse the entire Web in VR when Google rolls out Daydream. Since Google is also rebuilding YouTube, Street View, Play, and Photos with VR modes, a VR-mode for Chrome, when ready, will have a world of VR-content to browse, such as a more immersive Street View experience or VR concert viewing on YouTube. When Daydream is rolled out, we should be able to use the Daydream headset or Cardboard viewer to visit any website in VR, according to Upload VR. These developments demonstrate just some of the moving parts that will comprise Daydream, and they make Daydream seem like less of an abstraction and more of a tangible reality. Whereas Facebook communicates its vision for VR with good theater and well delivered messages, Google opens the hood to give you a glimpse at the engine. The animation demo might seem like inside baseball to anyone who does not design for a living, but making VR accessible to creatives is important. Breakthroughs in any endeavor occur when the tools of production are accessible and democratic. Rock and roll took off because anyone who could get their hands on even a cheap guitar could teach themselves how to play. Basketball exploded in popularity across the United States in the 20th Century because all you needed was a basketball and a court to learn the game. And Google intends to make VR a breakthrough, too. As Rob Jagnow, software engineer, Google VR, wrote in a June 28 blog post, Google Daydream Labs is reducing the complexity for making VR animation by making it possible for creatives to design scenes by moving objects around in VR, instead of needing complex and costly software to design scenes in 2D. Jagnow indicated that Daydream Labs experimented with VR by allowing users to bring characters to life by moving toys around a screen. The Expeditions experience is more of a crowd pleaser. 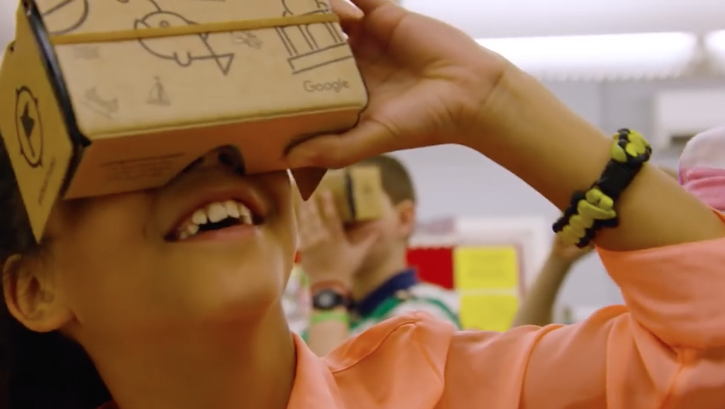 Google rolled out Expeditions in the fall of 2015 to participating classrooms. As reported in TechCrunch, more than a million students in 11 countries have gone on virtual field trips, and the collection of destinations has grown to more than 200. Launching Expeditions in the classroom is a smart long-term strategy. Google is betting that tools such as Expeditions will help make younger generations become more familiar and comfortable with VR. And as they do so, they’ll associate Google with VR. of Google as their preferred platform throughout their lives, which is similar to Apple’s approach of embedding its products in the classroom decades ago. As I discussed in a June 11 blog post, Google’s vision is to make VR accessible to all, with Google products being at the center of our everyday VR experience. The way Google sees it, VR will underpin how we search and discover, how we experience content, especially if we use Google’s own Chrome browser on mobile devices. Chrome is now the most popular Web browser, according to Gizmodo. Android has the largest global marketshare of any operating system on a smartphone, according to stastista.com. Google intends to strengthen those leads in an era of VR that Google sees coming. As the saying goes, the best way to predict the future is to invent it. Google sees a VR future on the horizon and intends for its own products to lead the way. But it’s not like we’re are all going to stop what we’re doing and start using Daydream when the platform becomes available. Even loyal Android users will take some time to adopt VR experiences. iOS users will watch that uptake (and, Google hopes, become envious) while pundits speculate about Apple’s possible move into VR. What’s clear, though, is that Google is priming the pump for a gradual adoption of VR through Daydream. Expanding Expeditions and sharing a demo for creating VR animation are all about getting us comfortable for a long-term change that is coming. And coming soon. This entry was posted in Google and tagged Cardboard, Chrome, David Deal, Daydream, Expeditions, Google, Superhype, virtual reality, VR. Bookmark the permalink.